This paper Sunburst Mirror craft will give your home some playful, trendy design flair. Not only is it a fun craft, but also quick, easy and economical to make. You have to love that! It's the perfect décor project to fill up empty wall needing a pop of color. The paper sunburst mirror craft is inspired by a style of mirror dating back to the seventeenth century. We can thank King Louis XIV, the “Sun King” for this design trend. Legend has it that he was quite the performing arts enthusiast, with the ballet his most favored art form. Not only did he enjoy watching the ballet, but he also performed in over 80 productions! How this relates to the sunburst mirror, is that Ling Louis loved playing the Sun in Ballet de la Nuit so much that he adopted the Sun as his symbol. The Sun Mirror was said to be a tribute to the king, and has been popular ever since. Sunburst mirrors grew especially popular in the 1940s, 1950s and 1960s. I remember them fondly as a part of my childhood. It seemed like every house in the neighborhood had a Sunburst mirror in the living room over the couch. The style went out of fashion in the 1980s and 1990s, but has had resurgence in popularity recently. 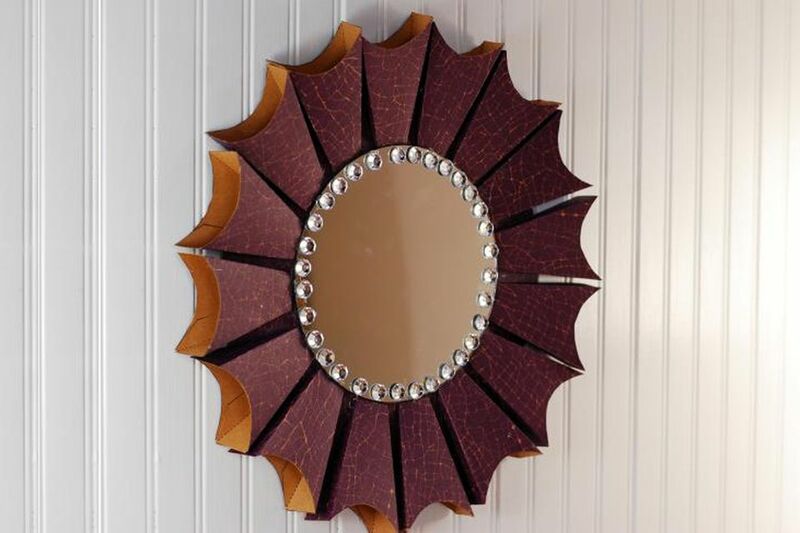 I wanted to make a Sunburst Mirror that has an artsy twist. Papercrafting seemed like a perfect way to achieve this goal! This mirror craft is quite fun and easy to make. It can be made by hand, or cut on a die cut machine. I've included free die cut files for download, which will be compatible for most die cut machines. Cut an 11 inch circle out of chipboard. You can do this by hand, or with a die cut machine. A die-cutting file and pdf template for the circle are included in the download cut files. Cut an 11-inch circle out of card stock. As with the chipboard, you can cut this by hand or with a die cut machine. A die cutting file and pdf template for the circle are included in the download cut files. 1. Using hot glue, attach a seven-inch craft mirror onto the chipboard directly in the center of the base. If you are making this project by hand, print the “ray” pdf template piece on the back of the card stock. Files are provided for both 12” x 12” and 8.5” x 11” paper sizes. Cut out with scissors, then use a bone folder to score fold lines. Cut seventeen paper rays by hand or by machine. Fold the cut rays as in the photo above and glue the tab into place with a hot glue gun. Position the rays around the mirror. There should be a small amount of space between each piece. Use a glue gun to secure the rays in place. (Optional) Give your mirror some pizzazz! Using hot glue, attach bling of your choice around the outside edge. Hang your mirror on the wall. You can hot glue a hanger on the back or use double stick tape. Stand back and admire your craftiness!